I have decided to try Microsoft Office 2013. Unfortunately Office 2013 failed to install from web. 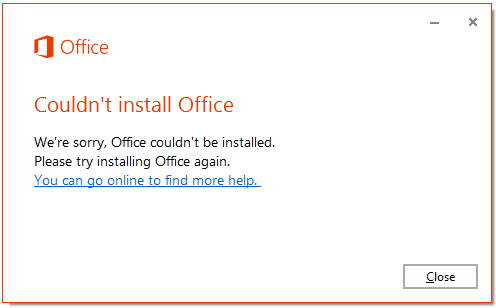 I got the following setup error message "Couldn't install Office" when I try to install Office 2013 every time. We're sorry, Office couldn't be installed. Please try installing Office again. You can go online to find more help. First I thought the firewall settings of my office environment prevented Microsoft Office 2013 installation, but later I realized that Office 2013 will not install easily this way. If you can not install Microsoft Office 2013 Preview like me, you can download Office 2013 and then try to install it as a workaround. You can download Microsoft Office 2013 setup files from Microsoft TechNet using your Passport account following URL Product Key Distribution for Office. The referred TechNet center will provide you an activation key (a Microsoft Office 2013 product key for preview version) and both links to download 32-bit Office 2013 setup and 64-bit Office 2013 setup files. Installing Office 2013 by downloading setup files will enable you to install Office of different versions side by side without any conflict.